Hey there!! 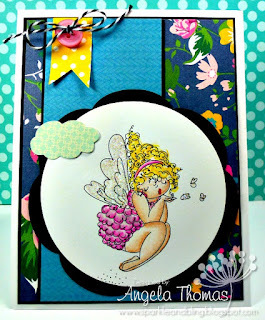 Are you enjoying the sneak peeks at Stamping Bella??? All I know is that I'm in love!!! My wallet is going to take a big hit on Tuesday when the new release comes out. For my card, I have used the new image called Edna Blows a Kiss. I love the fact that she`s a plus size girl just like me!! Now make sure you head on over to the Bella Blog to comment so that you have the option to win! !